Leo Triplet, M65, M66 and NGC 3628 group of galaxies. LLRGB with4 hours of Lum and 45m each RGB all binned 1x1. Taken with TEC 140 @f7 and FLI ML8300 camera. By Lynn Hilborn, WhistleStop Obs, Grafton, Ontario on March 22,29 and April2, 2011. Winner of Royal Astronomical Society of Canada 2011 "High-Magnification Deep Sky imaging Award"
Winner of SkyNews Magazine 2011 "Best Deep Sky Digital High-Resolution Image Award"
Editor's Choice, Sky and Telescope Magazine - Photo Gallery and Editor's Choice - Picture of the Week, SkyNews Magazine. 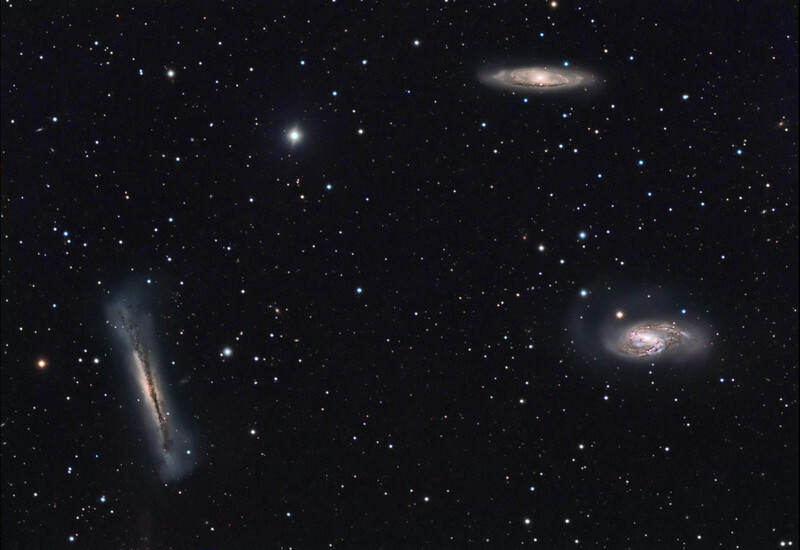 With permission of Robert Gendler...NGC 3628, M65 (NGC 3623) and M66 (NGC 3627) are a well known conspicuous grouping of galaxies in the constellation of Leo. The tight grouping are all within a 1 degree field in the sky and are physically and dynamically related as all three reside at the same distance of about 30 million light years. The distance between M65 and M66 is only 160,000 light years, the same distance between the Milky Way and its interacting companion, the Large Magellanic Cloud. The distance between NGC 3628 and the other two members of the triplet is slightly more than 300,000 light years. The galaxies exhibit evidence of mutual disturbance suggesting that the Leo triplet is a dynamically bound interacting system of galaxies. The two galaxies which show the greatest evidence for a previous violent encounter are NGC 3628 and M66. Distinct morphological evidence exists that are believed to be the telltale signs of this interaction. NGC 3628 is noted for its faint optical plume that extends over 300 light years from its eastern tip and which contains some 500 million solar masses (about 15% of the total mass of NGC 3628). Star formation has been detected within the plume coinciding with the time of the encounter and therefore confirming its tidal origin. Surveys of neutral hydrogen gas using the tracer CO revealed a large bridge of gas between M66 and NGC 3628 as well as a gaseous plume coincident with the eastern optical plume observed in NGC 3628. Simulations by Toomre (1977) and Rots (1978) have modeled the orbits of M66 and NGC 3628 and concluded that these galaxies came within 80,000 light years of each other some 800 million years ago, and that encounter was responsible for the plumes and bridges we see now. In addition the rotation curve for the eastern part of NGC 3628 falls sharply after reaching a maximum which is believed to be a strong signature of a previous interaction as rotation curves typically remain flat or rise in normal spirals. M66 also shows some disturbed features believed to be related to the remote encounter. A fossil starburst region near the nucleus of M66 dates to the same time as the proposed interaction slightly less than one billion years ago. The outermost southern gas clouds of the galaxy show a peculiar counterrotation in respect to the inner gas. Even more striking is an enormous gas concentration of about 400 million solar masses within the center of M66. Most likely this gas was accreted at the time of the closest approach of the two galaxies. There are several other asymmetries and distortions observed in the disks of NGC 3628 and M66 at both optical and radio wavelengths which are likely attributed to the previous encounter. Since multiple galactic rotations have occurred since the encounter it is difficult to trace backward the spatial relationships of the galaxies that existed at the time of the encounter. In comparison to the other members of the Leo Triplet, M65 appears much more quiescent and stable. There are no obvious asymmetries, plumes or starbursts. One scenario raises the possibility that M66 and NGC 3628 existed as an orbiting bound system prior to the interaction with M66. M66 may have entered by way of "infall" into the small bound system of galaxies during the time period of the last encounter.